Anne Fortier’s Juliet uses a popular formula for crossover chick lit/historical fiction; a young woman currently going through a rough time delves into her family history and unearths dark secrets and, quite likely, a love interest along the way. It’s a shame that she does because a good story is a good story no matter what convoluted and unlikely means you use to tell it and it appears that in this case, Fortier has found a cracking story and used a dull contemporary parallel plot to present it. Twenty-five year old twins Julie and Janice Jacobs were raised by their Aunt Rose in the States, having been orphaned as children in Italy. When Rose dies, Julie is astonished to learn that Rose has left the house and everything in it to Janice. So far she’s lived her life in Janice’s shadow; as teenagers Julie would stay at home with Aunt Rose, while Janice would be out with friends every evening; as adults Janice runs a successful dating agency while Julie earns a pittance teaching Shakespeare to kids at summer schools. So when Umberto, Rose’s faithful old retainer – more like a family member than a servant – tells her that Aunt Rose has actually left her something, Julie is in no hurry to tell Janice. Umberto tells Julie that her real name is Giulietta Tolomei and he gives her the key to a safety deposit box stored in a bank of Siena. In a letter written in her final hours, Rose tells Julie that she must go to Siena where something valuable is waiting for her. The contents of the safety deposit box appear, at first to be fairly unremarkable: a necklace and some old papers. But when Julie starts to work through the papers she makes an incredible discovery; the letters imply that long before Shakespeare penned his famous love story, the real Romeo and Juliet lived, not in Verona but in Siena and, what’s more, Julie appears to be a descendant of Juliet. But Julie has a lot of work to do before she finally learns the truth and, before long, she realises that there are other people who seem desperate to know too. “Romeo and Juliet” is one of my favourite Shakespeare plays and, although I knew a little of the theories that surround the story’s origins, I was keen to learn more and, in that respect, this novel didn’t disappoint. It is believed that Shakespeare likely read, or at least heard of one, or more, of several vaguely similar tales about a pair of tragic lovers and Fortier takes one of these as the basis for her story. The chapters alternate between contemporary and fourteenth century Siena. The historical element of Juliet is excellent; the detail is well researched and Fortier excels in bringing to life the streets of old Siena. Some of this spills into the contemporary story but it’s more laboured, such as in the scenes where the manager of the hotel Julie is staying in, vexed with her ignorance, gives her impromptu history lessons. Medieval Siena was split into districts called contrade and the inhabitants of each contrada were fiercely patriotic; each year there would take place a demanding horse-race – the palio – where the best rider from each contrada would compete to win the prestigious flag. Fortier’s depiction of the narrow streets that suddenly open into beautiful squares lined with grand palazzi is highly atmospheric. Where the novel falls down is in the attempts to make the contemporary story mirror the fourteenth century plot; in order to do this Fortier’s story takes some silly and unlikely turns (Janice’s sudden arrival in Siena is unintentionally hilarious). The idea of tracing the old story and comparing it with Shakespeare’s version is interesting in its own right so to try to make the present day narration reflect the medieval story is wholly unnecessary – doesn’t Ms Fortier have enough belief in her idea to present it more simply? Another problem is that Fortier expends so much effort in painting this wonderful portrait of medieval Siena that in comparison her modern day characters are somewhat pale and insipid. Julie’s tendency to say the wrong thing comes across as irritating rather than unfortunate and endearing and, as a result, it’s rather difficult to care very much what happens to her. The contemporary romance is inevitable from the outset but this would be forgivable if only the hero was a good deal more dashing. Fortier fails to capture a spark between them and while I should have been anticipating fireworks, I had to make do with a few damp squibs. 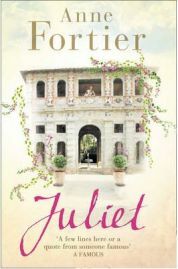 Juliet is not a complete washout; had Fortier put more effort into her contemporary characters, or even not bothered to try to make the two stories follow each other so closely, it would have worked much better. Unfortunately with fairly long chapters it’s not that easy to skip the modern day plot which I might have been tempted to do otherwise. The idea is brilliant, the execution patchy; a better editor might have made all the difference.